Description: Automatic fruit and vegetable sorting machine, adopting balance and lever principle, is utilized to classify fruits and vegetables by weight. 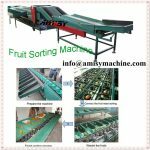 Amisy fruit sorter machine is characterized by accurate weighing precision, high efficiency, easy operation, wide application, adjustable sorting grade and etc., and it is widely used for sorting apples, pears, persimmons, onions, potatoes, lemons, mangoes, pomelo, jujube, dragon fruit, and other round fruits. Therefore our sorting machine is the best classification system of agricultural products equipment. 1. Advanced design, steel structure with long service life, convenient to move and easy to maintain. 2. Fruit sorter machine is automatic, saving labor and time, and controlled by PLC, easy to operate. 3. The sorting grade can be adjusted based on your demands. 4. High output, low power consumption and low noise. 5. Durable and well design fruit plate, no damage to the fruit. 6. In automatic transmission, fast accurate measurement and correct classification for various grades of fruits and vegetables. Our fruit sorting machine is widely applied in fruit planting base, fruit processing plants, orchard, fresh fruit and vegetable storeroom, refrigeration storage, fruit processing company, fruit and vegetable supermarket, food processing plants, food refrigerators and etc. It is suitable for sorting apples, pears, persimmons, onions, potatoes, lemons, mangoes, pomelo, jujube, dragon fruit, and other spherical fruits.